Dar Roumana dining room. Photo by Johanna Read TravelEater.net. Seasonal, local food, a culturally and environmentally sound approach, and service that makes you feel like you’re a treasured guest at the home of an exotic friend are what Dar Roumana is all about. This five-room boutique hotel is in the Fez medina, the largest car-free urban area in the world. In the medina it takes extra effort to run a hotel, especially a sustainable one, but owner Jennifer Smith, chef Vincent Bonnin and GM Vanessa Bonnin do just that. Vincent’s kitchen is famous amongst Fez’s foodies, whether they be suppliers, visiting chefs, or eaters of the expat, local, tourist or feline variety. Feline?! Garbage is a major issue in any city, especially in a city without cars. No cars means no trucks to pick up garbage, recycling or compost, and sadly Fez citizens leave a lot of litter in the medina’s labyrinth of streets and alleyways. Fez is also a stone city and there are next to no gardens in which to deposit compost. But local cats know that Dar Roumana’s chefs leave scraps outside the kitchen window, and these feline foodies do an excellent job of ridding the restaurant of its food waste. Dar Roumana - outside the kitchen. Photo by Johanna Read TravelEater.net. Dar Roumana’s Mediterranean-Moroccan menu changes daily and features whichever local foods are at their freshest. All dishes are made from scratch to avoid packaging, processed foods and added chemicals. Vincent has worked hard to build a sustainable food scene in Fez. The restaurant has carefully built relationships with the region’s best co-op and artisanal suppliers, and is educating suppliers about the differing needs of high-end restaurants. Vincent even provides advice to the visiting chefs at Restaurant Numero 7, a restaurant which hosts chefs-on-sabbatical who come to Morocco to increase their knowledge of local ingredients and customs, and to learn how to run a restaurant in what is essentially still a medieval city. Dar Roumana. Getting ready for dinner. Photo by Johanna Read TravelEater.net. By staying at Dar Roumana, you’ll be sure to secure a table in their very popular dining room, and won’t have far to stumble up to bed if you’ve over indulged. Each room in this dar is unique. They’re decorated with the work of local artisans and include handmade furnishings, mosaic floors, and cedar ceilings and doors. The beds with their 100% cotton linens are extremely comfortable. The building was originally home to the Bouayad family and was built in 1900. The elaborate doors and window frames are all original, as is much of the carved plasterwork. The decorative tiles were installed in the 1920s to celebrate the marriage of one of the Bouayad daughters. When the house was purchased in 2002, the extensive restoration work took three years. For example, the wiring that was strung along the walls needed to be covered for safety. However, as much original structural and decorative wood and plasterwork was kept as possible. Dar Roumana canopy. Photo by Johanna Read TravelEater.net. If your room is on the ground floor, be sure to go up to one of the public rooms on the upper floor to admire the central courtyard’s detailed carvings and painted woodwork. You’ll pass by a few on your way up to the rooftop terrace, where you can enjoy your breakfast and afternoon tea. 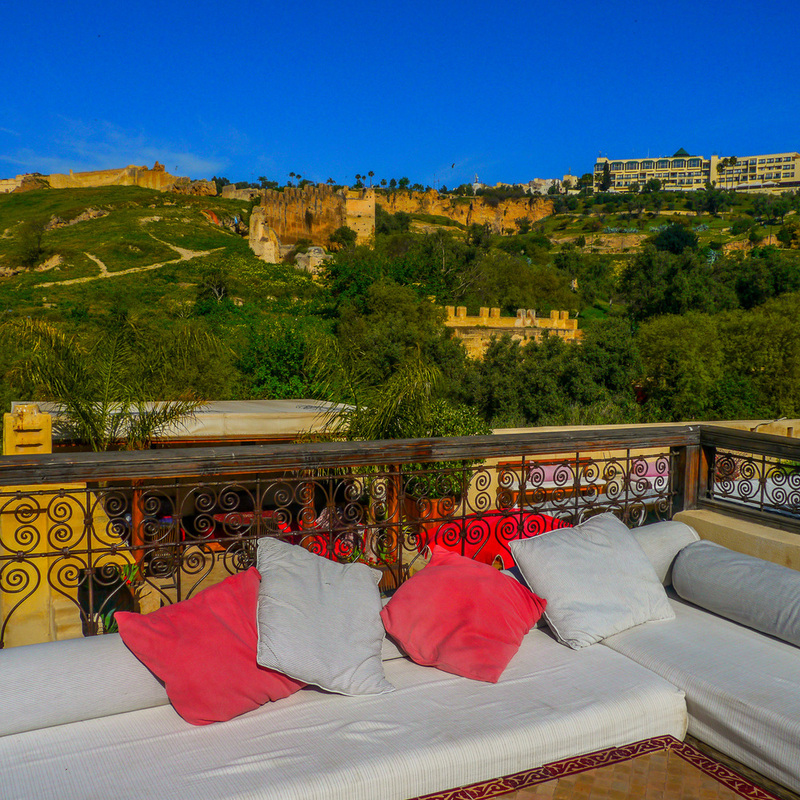 Admire the views over Fez and watch horses grazing on the city’s green hill, and perhaps see the tannery workers laying out leather to dry in the sun. While many things are still made by hand, environmentalism is not well known in Morocco and environmental technology is not easy to find. At Dar Roumana, they’ve installed timers and eco-lighting and re-use water from the laundry’s condenser and fountain. They buy products in bulk and use refillable containers, and use natural cleaning products wherever possible — vinegar and water for windows, linseed oil for wood, lemons for brass and copper, and guests’ leftover newspapers for polishing. Dar Roumana also suggests how guests can improve sustainability. They provide an organic cotton tote bag so that you can avoid plastic bags whilst shopping (and coach you how to politely refuse plastic from merchants who love the ubiquitous packaging). They advise the best times to use water during the drought-ridden Moroccan summers, about local customs for bottled water, and other restaurants and shops in Fez that are known for their sustainable business practices. If you’re interested in authentic Moroccan experiences, Dar Roumana knows the best. One of the staff, Nezha, can draw henna tattoos on your hands or feet, so you can avoid the poor quality henna, high-pressure environment, and tourist-unfriendly prices on the street. Vanessa has curated a selection of personal cultural excursions from which you can choose, such as a workshop to learn how to hand-roll couscous, a traditional cooking class with a local family, and a boutique winery tour and tasting. They also know where to get the most unique handmade Moroccan products, and share the website where you can buy direct from Moroccan artisans.